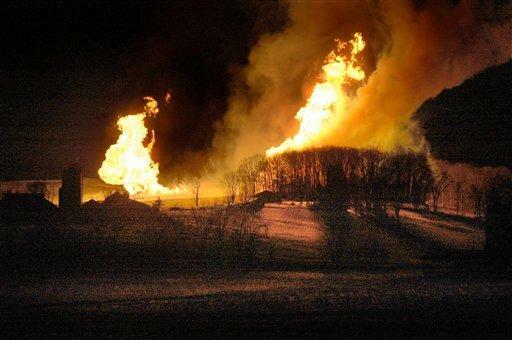 HANOVERTON, Ohio (AP) - People miles away reported hearing a "blowtorch" sound and could see a glow in the sky from a gas pipeline explosion that shook residents in eastern Ohio, an official said Friday. "From 20 to 25 miles away they could hear a cracking," said Jim Hoppel, president of the board of commissioners governing Columbiana County, Ohio. "Some people said it was like a blowtorch." The Thursday night explosion and fire happened a day after a house explosion in neighboring Pennsylvania took the lives of five residents and destroyed several homes in Allentown. A dispatcher for the county sheriff's office said officials had no reports of injury in the blast near Hanoverton. She said there was no mandatory evacuation but those in the village of about 400 people and surrounding towns who wanted to leave their homes could find shelter at a school and the Salineville Fire Department. The explosion occurred about 10:30 p.m. Thursday. A television station initially reported one house caught fire but Robert Newberry, a spokesman for El Paso Corp., which operates Tennessee Gas Pipeline, said there were no structural fires. One house was damaged, however, the company said. Newberry said only one nearby resident was evacuated. Hoppel said he observed the sky "all lit up" from the county seat in Lisbon, about 20 miles from the scene of the blast. Others up to 40 miles away reported seeing a glow, he said. The explosion occurred in an area of farms in the rural county bordering on Pennsylvania and West Virginia, Hoppel said. "Had it been close to one of our villages or cities, why, it would have been much more serious," he added. Company spokesman Richard Wheatley said an investigation into what caused the blast is under way. The explosion involved a 36-inch, buried transmission line that dates to the 1960s and carries natural gas through the region, he said. Mechanisms in the section that "failed" automatically shut off the segment and the residual gas burned off, he said. The segment was last inspected with inline technology in 2005, and inspectors found no "anomalies that required immediate action," he said. In 2007, El Paso Corp. agreed to a $15.5 million fine as part of a settlement with the government involving an explosion in 2000 near Carlsbad, N.M., that killed 12 people camping near a 50-year-old pipeline. The settlement included a commitment from El Paso to spend $86 million to modify its 10,000-mile pipeline system. Wheatley said Friday he didn't immediately know whether the pipeline segment involved in the Ohio blast was modified because of the settlement.